Come join over 60 vendors each Wednesday morning at the St. Johns County Pier Park (St. Augustine Beach Pier ) from 8:00 a.m. – 12:00 p.m. 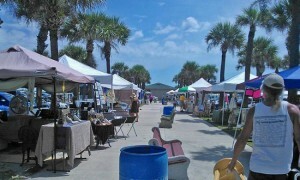 The weekly event, sponsored by the St. Augustine Beach Civic Association, offers an a variety of produce, prepared foods, local seafood, arts & crafts, jewelry and fair trade goods with an emphasis on home grown, hand picked and hand crafted items that are unique. So come join us each Wednesday at the St. Johns Count Beach Pier Park located at 350 A1A Beach Blvd. in St. Augustine Beach. You can learn more about The Wednesday Farmers Market by visiting the Civic Association website, and checking out the following short video created by Nico on the Sceen.